If you insist, here’s how to make your own cannoli dough. But we’ll have to call them non-wonton cannoli. 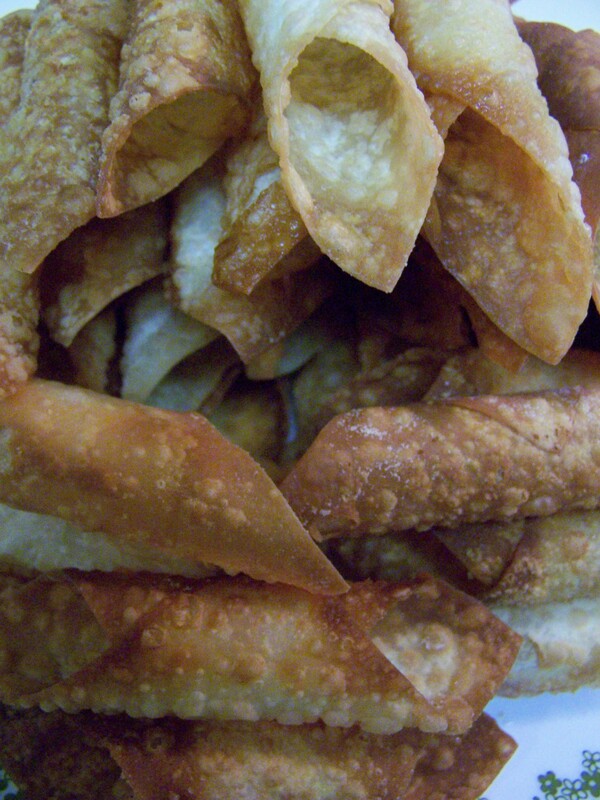 The advantage of using the wonton wrappers for the shells, of course, is to save some time and work. But if you have a pasta maker or like to roll out dough, here’s how to make your own dough for the shells. See part 1 and part 2 for the rest of the recipe. Mix together flour and sugar. Cut in the shortening. Stir the egg yolk into the wine. Mix the egg/wine into the flour. Continue to mix the dough until the dough is stiff. Cover and let the dough rest 30 minutes. Divide the dough in half. Cover one half. Roll out the second half paper-thin. Cut 3 inch squares from rolled dough. Adjust the size of your squares to fit your cannoli tubes. Fry the squares as indicated in part 2. Fill the fried tubes as in part 1. This entry was posted on 01/09/2011 at 09:32 and is filed under Recipes, Recipes, food, cooking and related items, Vegetarian. You can follow any responses to this entry through the RSS 2.0 feed. You can leave a response, or trackback from your own site.